Autistic Self Advocacy Network's Julia Bascom on Sesame Street’s new Muppet. On Monday, Sesame Street introduced its newest Muppet, a redheaded 4-year-old with a fondness for tag and a stuffed bunny, to the world. Julia is the first autistic character ever to be introduced on the beloved children’s program, a milestone for autistic representation on screen. But while the character made her official Sesame Street debut just days ago in “Meet Julia,” the character has been around since 2015 as part of Sesame Street’s “See Amazing in All Children” initiative and was conceived through careful research and planning that included getting input from autism organizations and the autistic community directly. Among those consulted was Julia Bascom, executive director of the Autistic Self Advocacy Network. (She assures me that the name similarity is pure coincidence.) Slate spoke to Bascom shortly after the episode’s debut about what advice she and her organization offered, what she thought of Julia’s big debut, and why autistic representation is so important, especially for children. Slate: How did you come to be involved with Sesame Street in the first place? Julia Bascom: We reached out to Sesame Street after the [initial 2015] announcement because there tends to be a trend when groups talk about autism to leave out autistic people from that conversation, which, obviously, my organization and self-advocates generally think is a big problem. As founding principles go, I think it’s pretty useful. But we wanted to make sure they were talking not just to us but to other self-advocates and people who experience autism in different ways. What were the early conversations like while designing Julia’s character? We wanted to be sure, in keeping with the title of the initiative, that the portrayal was positive and respectful and included Julia’s strengths and what she’s like as a person. We didn’t want to show her as an educational object or an object of pity or a burden on the people around her. And Sesame was very on board with that. I think you could see that that’s how they approach their work generally, which was great to see. We also really wanted to focus on making sure that Julia had as much agency as possible and that the other characters were modelling respectful and inclusive behavior, since obviously a lot of typical kids are going to be watching Sesame and can learn a lot from that as well. But our big point was always just pushing and pushing and pushing to remember that autistic kids are going to be watching Sesame Street as well. The audience is not solely nonautistic peers or families. That said, a lot of this episode does come from a neurotypical perspective, framed around the idea of Big Bird meeting Julia and learning about autism for the first time. In fact, Big Bird initially assumes Julia doesn’t like him because she doesn’t respond to him right away, which obviously is not the case. Were there any specific misconceptions surrounding autism that you wanted to clear up with this character? We can list misconceptions about autism all day long and some of them will be addressed and some of them won’t. I do think it’s significant that Julia is a girl. There’s a pretty popular belief that girls are less likely to be autistic than boys, and there’s not actually a lot of evidence for that. But there is a lot of evidence that girls, because of bias, get diagnosed later and less often, so it was really great to see a girl autistic character. They made a big deal of how Julia wants to play and she wants to have friends, which obviously addressed a lot of stereotypes in that. She doesn’t talk very much, but she’s communicating constantly. Sometimes she’ll say “yes,” sometimes she’ll move her body in a happy or excited way, sometimes she’ll repeat something that someone else has said, and all of those things are recognized as communication. You have the stereotype of autistic people who are noncommunicative, but I’ve never met a noncommunicative autistic person. I’ve met lots of people who are communicative in nonstandard ways, and it’s really important that people how the other characters are responding to that. That’s a big deal! I was really excited when I heard that line. It’s a way to give Julia agency in an episode that, sort of by necessity, has a lot of people having conversations about her without her being present. You know, I don’t know a lot of autistic 4-year-olds who are ready to get up and eloquently explain their disability yet. When you’re 4, you need other people to help those conversations take place. But it was such a good way to give her agency and also just to model for viewers that people with disabilities have boundaries and have a right to privacy about our disabilities and that telling other people that information is something that a character needs to consent to. It’s this little line that’s just kind of tacked on but it has so much in it. Julia is performed by puppeteer Stacey Gordon, and the character shows some physical traits associated with autism, including flapping her hands and avoiding eye contact at times. Did you have any input about what mannerisms Julia might have? We were never given a list of traits and asked to pick some or anything like that. But my understanding is that they went for things that are fairly common and fairly visible, while also being careful to say this is what autism is like for Julia. At one point while the Muppets are playing tag, a siren goes off, and Julia has a strong, upset reaction to the noise. What did you think of that scene and how it played out? What I really noticed is that she was being supported through her meltdown. She’s not being punished or yelled at or shamed for having this reaction. When Big Bird says, “Well, it wasn’t that loud,” the other characters say, “It’s loud for Julia,” which again is something that’s really important even for adults to hear, but particularly for preschoolers to hear. And what impressed me is that Alan responded to that the same way he would to other characters having a hard time. They go to a quiet place and they do some deep breathing. Sesame’s had this big social-emotional education component for several years, so they’re calling on skill and concepts that kids watching the show are already familiar with. It’s not just helping Julia but reminding typical kids how they can handle having a hard time as well. It’s not stigmatized or something Julia gets in trouble for. And the reality is that autistic people get in trouble for that kind of thing all the time, so to see that being handled so respectfully, with a focus on You feel really bad right now, we’re gonna find ways to make you feel better, was really encouraging to see. Julia is the focus of the first 10 minutes of the episode, which was made widely available online. But then she’s not really involved in any of the educational segments that follow in the HBO episode. What do you hope to see Julia doing in future episodes? That’s really a critical question. What’s gonna determine the success of this initiative is whether or not Julia is integrated into episodes going forward and background moments where autism isn’t talked about. A lot of shows are good at doing a special episode about a character with a disability and then the character never comes back. What’s most important in terms of representation and in terms of having a transformative effect is just seeing the character over and over again in everyday situations. I’m hopeful that she’ll be included like that in future episodes, because Sesame has a pretty strong track record with other characters with disabilities. My favorite clip of Julia so far, and the one that I think is the most transformative, isn’t actually in the episode, it’s one of the clips that was released online. It’s her and Abby and they’re just sort of playing side by side and Julia starts humming the Sesame Street theme and then Abby starts singing it and they go back and forth. They’re happy and they’re playing and never say the word autism, but autistic kids are gonna see that and know that she’s autistic and typical kids are gonna see that and recognize their friend. I also love another clip they released where Abby is having a hard time blowing bubbles and Julia comes up with a creative solution and sort of saves the day. Right! There’s that moment in the episode where Alan is explaining that Julia does things a little differently and sometimes that’s just what works for her—and then he tells Big Bird, “but she also does some things that you might want to try.” And they’re using the way she’s playing tag as the example there. The portion of the disability rights movement that my organization is involved with is called neurodiversity. It’s this idea that there are lots of different ways to have a brain and lots of different ways to be a person and they’re all important and valid. That’s something that gets overlooked a lot when you’re talking about autism or folks with intellectual disabilities. It was great to see Julia portrayed as this curious kid with thoughts and ideas that other kids can learn from as well—and not just in a “how to be nice to someone” way but in a “how to blow bubbles” way or “how to play tag” way. The episode just debuted, but Julia as a character has been around for a while. What has some of the response within the community been like to her character? Obviously you can never design a character that makes everybody happy, especially with such a diverse disability, and people have had different reactions based on their experiences. I’ve seen a largely positive response overall. The biggest disconnect is that the autistic community uses identity-first language, so saying, “I’m autistic” and not “I’m a person with autism.” The parent community tends to use “person with autism” language and that’s what Sesame Street uses, and so it’s frustrating to see such a positive representation and then use that language. Why is identity-first language so important? Disability communities have different preferences for this. The autistic community prefers identity-first language, and that has to do with the way our disability has been perceived historically. Even today, people tend to see autism as a some sort of external thing that happens to someone and as something that needs to be combatted or fixed. And autistic people have been saying pretty consistently that that kind of viewpoint damages people. Your neurology is not really separate from who you are as a person. Austism isn’t an inherently negative thing. It can be a positive thing and a strength and a source of happiness, and so, rather than trying to erase it, it’s important to do, really, what Sesame does and recognize the uniquely autistic ways of being in the world and focusing on inclusion and acceptance. But you feel like the language being used doesn’t reflect that. Right, it’s disconcerting for some people. But other than that, it’s been a largely positive response. You’ve written in the past about how important it was for you personally to see a few meaningful autistic characters on screen, like Abed Nadir on Community. Why is that such a big deal? To see someone who is like you, who moves like you on TV, when you’re not used to seeing that, is—it’s hard to describe. It’s like trying to describe water to someone who has never drunk water. It’s such a simple thing, and you weren’t even aware that you didn’t have it until you do. I had no idea that I’d been waiting to see an autistic character played on Sesame Street until I saw that clip with Abby and Julia. They make me feel real. Were there any characters when you were a kid that you saw yourself in? I didn’t watch a ton of TV as a kid, but I do feel obligated to say, the Count has been counting things for a long time, and I do that as well. 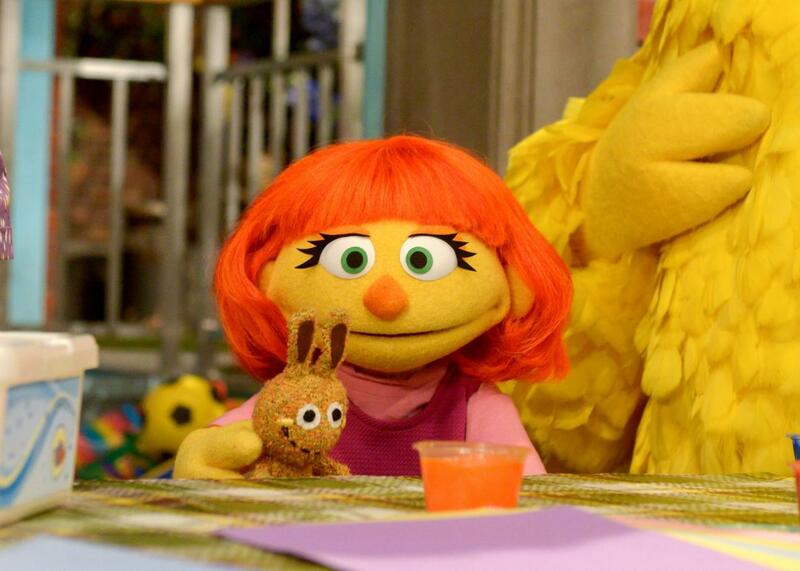 So while Julia might be the first official autistic character on Sesame Street, you can find some overlap elsewhere. What message do you hope autistic kids take away from seeing a character like Julia on screen? That they belong on Sesame Street. And just that they belong, period. Autistic kids tend to grow up experiencing a lot of bullying, a lot of isolation, and a lot of misunderstanding and stigma and anxiety, as a result. If this is something that can help even a fraction of those kids gain some self-acceptance, that’s going to have a hugely positive impact on their lives going forward.